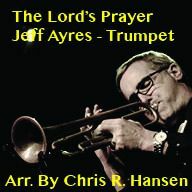 The Lord's Prayer Arranged for Trumpet and Piano by Chris R. Hansen - Medium to Hard Difficulty. Download the FREE recording of Jeff Ayers - Trumpet Phenom performing this with the Hark Up Horns Big Band. Purchase this Piano Trumpet part here. Contact us about getting the full Big Band version or the full orchestra version.